Oh, canned tuna. It's one of the healthiest and most inexpensive sources of meat you can buy. My mom always used to make tuna salad mixed with mayo, and I hate mayo (it just makes things taste soggy), so I wasn't a huge tuna fan growing up. 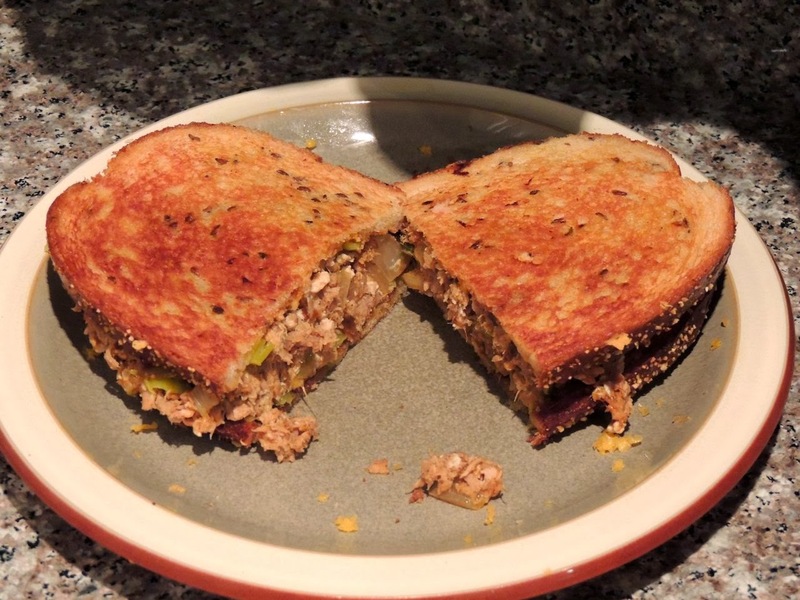 However, as an adult, I've created my own version of a tuna melt that I truly love. 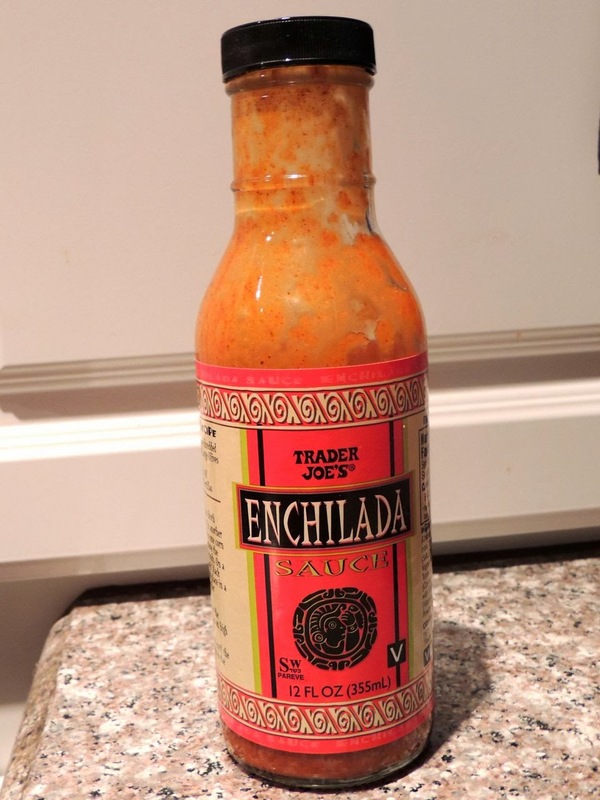 I used to replace the mayo with ranch dressing, but now I replace it with enchilada sauce from Trader Joe's. Yeah. It's awesome. Here's my easy and delicious recipe. 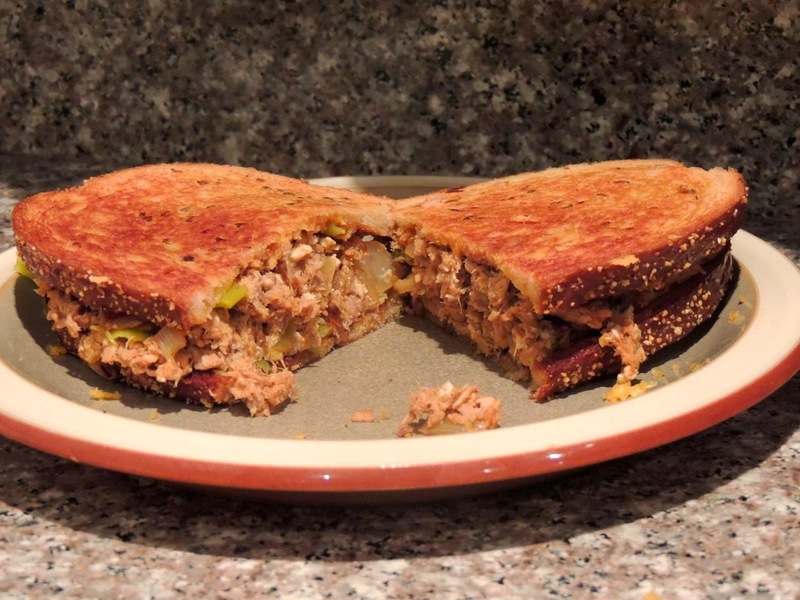 It's not like any tuna melt you've ever had before, and it's the only one I've ever had that I loved. In fact, I just ate the sandwich pictured here, and I'm totally thinking about making another one. It's just that good. Spray Pam in a non-stick skillet. Add onion and jalapenos. Cook until caramelized. Meanwhile, drain the water from the can of tuna. (I let my cats drink the tuna water...they love it!) 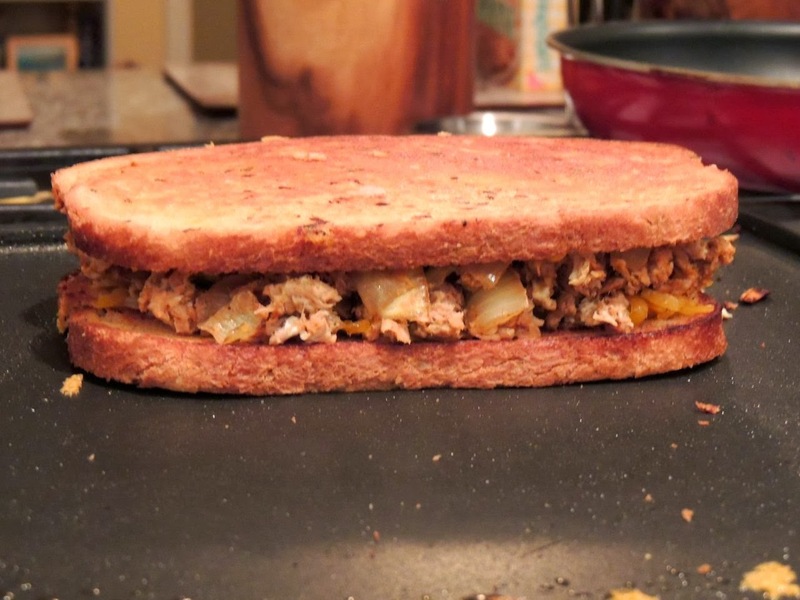 Add the tuna, and mix with the onions and jalapenos. Add the egg white, and mix together until fully cooked. Turn off the heat. Add the enchilada sauce, a sprinkle of TexJoy (or salt and pepper) and stir to combine. Spray both sides of bread with spray butter. Spray Pam in another non-stick frying pan or on a griddle. Put the bread inside-down on the griddle and cook until the bottom is toasted. Remove the toast from the pan, and put one slice toasted-side up. On top of that slice, add half the cheese, half the peperoncini slices, all of the tuna mixture, the other half of the peperoncini slices, the rest of the cheese, and the other piece of bread, toasted side down. Spray the frying pan or griddle with Pam again. Put the sandwich on the griddle and cook until the bottom piece of toast is toasted on the bottom. Then carefully flip the sandwich over with a spatula and cook until the bottom piece of toast is toasted on the bottom. Transfer the sandwich to a plate, and cut in half. This sandwich would be great with Baked Sweet Potato Fries or my Everyday Salad, of course, I think any sandwich would be great with these sides! 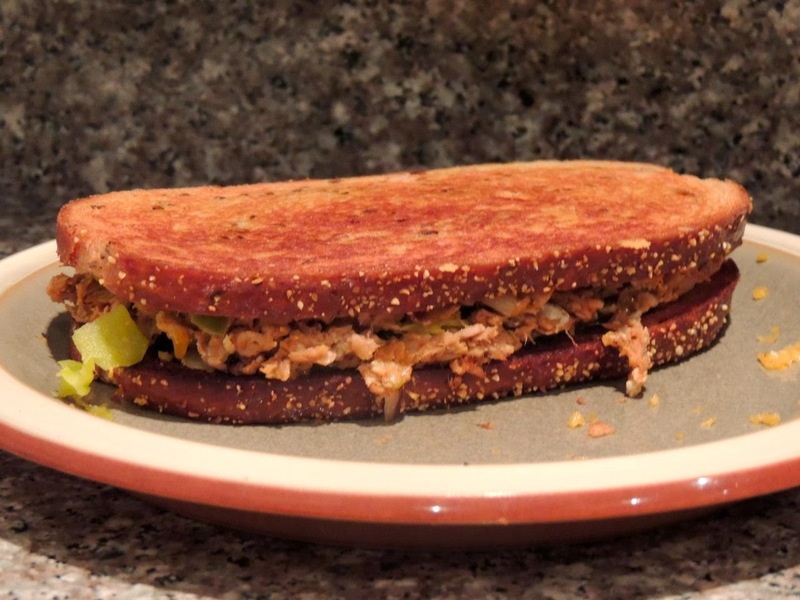 An easy variation of this sandwich is to make it with canned salmon instead of canned tuna. 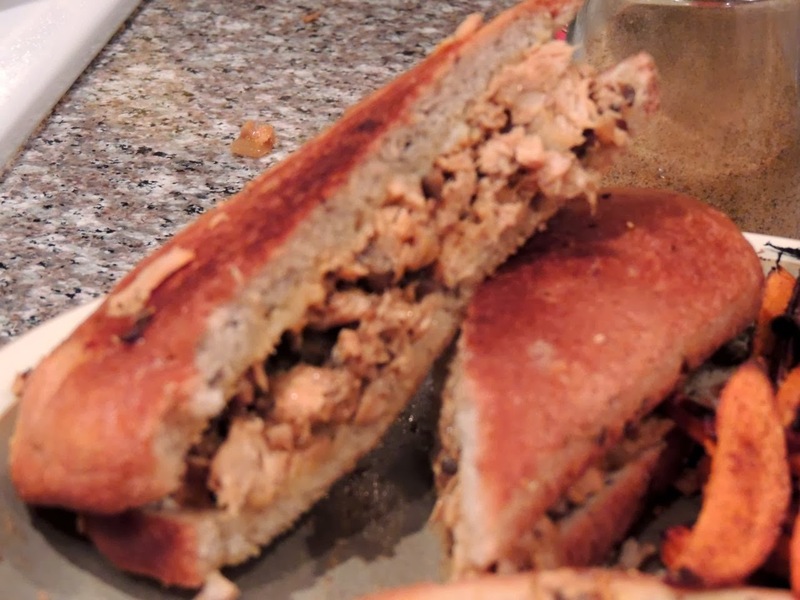 Salmon has so much flavor that it makes this sandwich even more delicious. 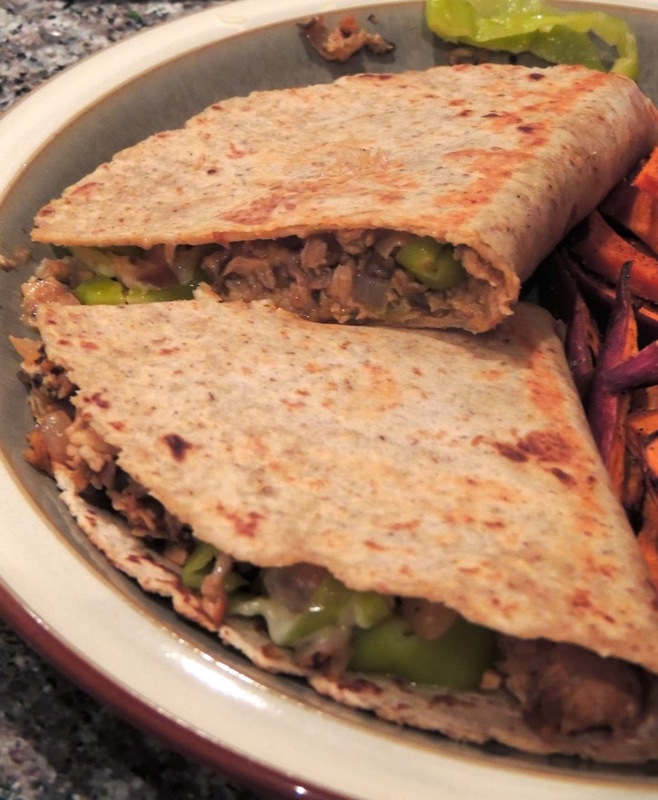 You can also use a tortilla instead of 2 slices of bread and make the sandwich into a quesadilla. However you choose to make it, Happy Eating!